New Forest Cycling - where, how and when. 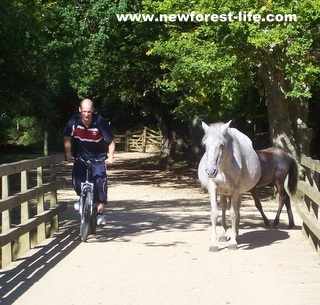 New Forest cycling is one of the very best ways to explore and discover the beauty and diversity of this National Park. I hope my info is helpful to you but don't forget you can always ask me any questions you have via my Contact Me link. if I don't know the answer I'll certainly try my best to get it for you! New Forest Cycling info for you. Here's a handy walks and cycling map from the New Forest National Parks Authority. If you want to go for the road options, stick to the villages and then head out over a cattlegrid asap! From Brockenhurst village head off towards the Ober Water routes (as I've recommended) using rough SatNav guide of SO42 7ZG or OS Grid ref: SU 274 026 and just meander either along the road or follow the actual marked cycle trail. You'll go over the bridge above if you follow the cycle route, otherwise you'll eventually pass the Rhinefield House Hotel SO42 7QB and be on the Ornamental Drive. I was tempted to suggest routes from Lyndhurst and Burley but the roads are a bit more busy and you may want to test them out first before you get on your bike? 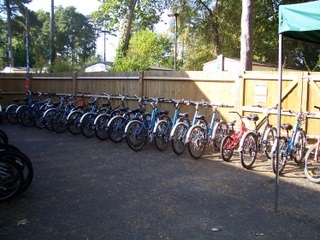 You can hire a bike if you need one at many places including some of the campsites and hotels. The main hirers are in the villages of Brockenhurst and Burley. These are my New Forest cycling hire recommendations. You can do New Forest cycling all year round if you want. Obviously you may prefer the warm spring days (less flies about) or hot summer days and evenings. New Forest tip: I always wear sunglasses and keep my mouth closed (difficult) as going along and getting a fly in your eye or mouth can nearly make you fall off! Because the tracks and paths are gravel based apart from a bit of puddling now and again you're pretty able to cycle 365 days a year - how good is that? Because we're quite a wet region you may get some flooding of paths as streams and brooks overflow, but if it's been that wet you may have decided to wait for drier weather anyway? Because many of the off road tracks and routes are gravel you will need quite a sturdy bike and mountain bike specs are the best to go for. The chunkier the tyre the more likely you are to stay on, corner more safely and go through any wet more easily. A couple of weeks ago we set off on an off road cycle track but by the time we got to the pub I'd got a puncture. More fool me for not checking my bike throughly before setting off!. At least it ended in a pub lunch and a pint but I did have to walk a couple of miles to get back to the car! 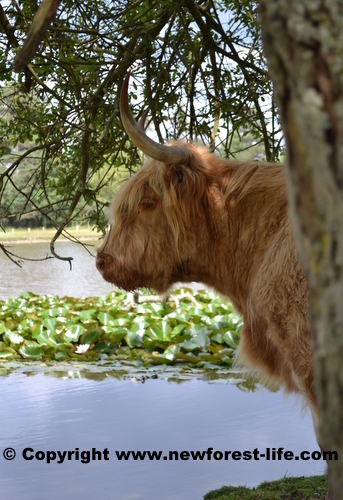 As you can see there are lots of wonderful New Forest animals and wildlife about. They generally keep away from you but they do chose to cross paths at the daftest moments. Please always watch out for them and give them the respect they deserve and most importantly of all - enjoy your visit! Here's some really great news - you can now get your very own personalised Ordnance Survey map for any area of the UK you like. This was kindly given to me recently. 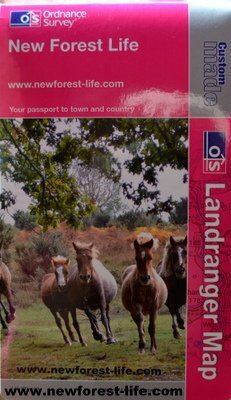 It shows the New Forest National Park on 1:50 000 scale and is my own personal copy with my website on. A wonderful present for anyone! Get my up to date news, views and photos on what I've discovered, or want to share with you. I can tell you the best place to see pigs and other New Forest animals. Please Contact me for any help. If you decide New Forest cycling is the best way to thoroughly enjoy your visit I hope you have a wonderful time. The good news is that generally it's quite a flat area and so hopefully you wont go home too saddle sore!